Ancient treasure means nothing if it’s buried uselessly under the sands, its legacy wasting away with the passing of ages. Artifacts only have power if they are present, whether for study or profit. Tomb Trader embodies this principle, unearthing a series of old mechanics but tying them together to bring them to new life. Much like its characters, it styles itself as something that it only touches incidentally, while it betrays a deeper personality once it gets the chance to set itself loose: Tomb Trader appears to be a basic set collection game but soon reveals itself as a slick negotiation and strategy game as well. The characters, meanwhile, have faked their way into a tomb on the premise that they are there seeking to preserve knowledge. They are, but only for their own motives, which they are willing to serve at surprising cost. The premise is just that: a group of people have somehow managed to get themselves into a legitimate archeological excavation, but for their own motives. The Professor seeks ancient texts to study, the Taxonomist hopes to recover preserved body parts, and the Collector is after anything he can get his hands on. Upon coming to the destination, each of these scoundrels makes their way into the tomb, only to find one another there as well! With limited time, they have to split the contents and get out or lose everything. Each of the seven characters has different items they are looking for, which translate to higher point values if they get more of their chosen goals. You have to manage not only your own goals, but those of the other players. Usually, keeping track of everyone is a big pain, as you have to keep a running tally in your head of each item and each person who is more likely to seek it. In Tomb Trader, the items themselves have large, easily identifiable portraits of the characters who are incentivized to seek them, making it effortless to strategize around that point. A few of the characters also have special abilities, but these are minimal and essentially translate to extra points for specific item types. To play, you place a round marker card in the middle of the table and give each player a location card, one representing being inside of the tomb and the other outside. The round card is the same standard card size as the rest of the deck, which makes reading it across a table a cumbersome proposition. Players begin with three coins and a random character. The coins are simple brown discs, which is disappointing on a few levels, They slide around easily, having no embellishment or detail on them at all. The color also feels closer to bronze than gold and doesn’t reflect the way they are depicted on the cards, further breaking immersion. Once everyone is set, you deal treasure cards face up into the outer and inner tomb locations, the number of which varies by player count. Then, each player puts one of their location cards face down, deciding which of the two locations they want to explore that round. Once everyone has placed their location cards, they flip face up and set a timer for one minute. No timer is included in the game box, which is frustrating to say the least. Yes, most people have such timers on their phones or watches, but it remains the case that components you need to play this game are not included in the game itself. During that minute, you have to decide with players in your location how to split up the treasure, trading at will between those items and gold, but not items you gained from previous rounds. If the minute runs out and not everything is split, all of the treasure is forfeit. This forces a few harsh choices, with some of the treasure being actively harmful and all the rest beneficial…to whoever can negotiate best. In the first round or so, these choices feel limited, but they end up being ways to start feeling out your opponents and their goals. Why did they choose a particular location? Are they trying to fake you out or genuinely going in a certain direction? If you can see what kind of treasure someone else wants, you can selectively take it to trade them later at a high cost. Knowledge is power, but it is not the only kind of power in Tomb Traders. While many of the cards are the usual fare in an ancient vault, many also have subtle ways to change the game in your favor. Some cards allow you to ignore negative effects, some let you choose another player’s next location, and a few are worth more if you gather the right collections of treasure together. There are more things to consider than whether cards fit together into specific sets, of which there aren’t many. This combination of strategy, negotiation, and set collection brings a lot of ideas together, and it does so by keeping many of them surface level. 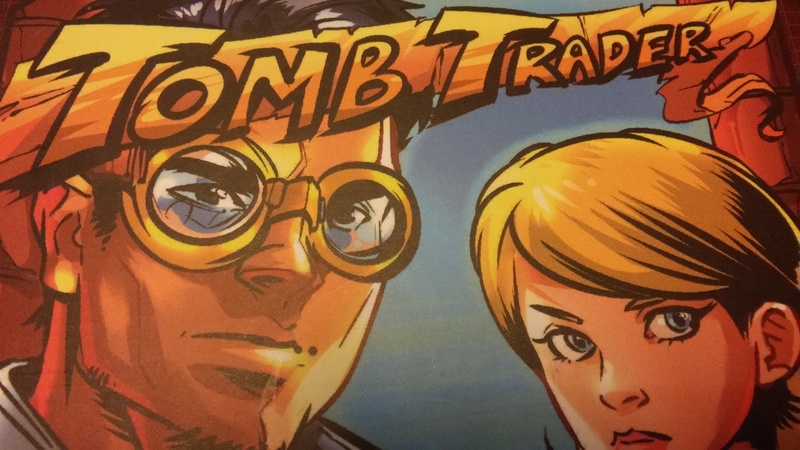 Tomb Trader is not as in-depth as any primarily set collection game or as full of intrigue as other negotiation games. With the minute-long time limit, its promise of a fifteen minute play time is one you can rely on, but it means that Tomb Trader is always going to be a lighter game. It delivers a dynamic, cerebral experience, and the gains it makes in combining these mechanics make up for the losses in complexity. Much like the plastic coins included, the cards and rulebook are of distinctly secondary quality. The rulebook is a single sheet of glossy paper, without any player aids included. It teaches the rules quickly and efficiently, which makes it all the more odd that it opens with a QR code and link to an online tutorial. Tomb Trader is simple enough not to need one. The cards also have a tendency to bend and fray at the edges, even if you are being careful with them. The art has the same bright colors and harsh lines that were a part of the adventure comics that inspired Indiana Jones and his ilk. It is also encouraging that the characters, of which there are not very many, are split across racial and gender lines without breaking the immersion of the setting. Each of the treasures has an appropriate melding of attractive but mysteriously threatening. Rare as it is, Tomb Trader also functions fairly well at all of its player counts, from three all the way up to six. With three players, it is possible for one person to gain an advantage by going where the other two don’t, but that is all part of the bluffing and counter-bluffing at the game’s core. With four or five, the chances that you will be alone in any area diminish greatly, so you have to guess at who is most likely to want what and plan accordingly. You have to watch what someone is going for to decide whether to counter them or attempt to ignore them. Things also don’t get cluttered because of the strict time limit. You will have to manage more people in the same time or lose everything. During that time, you will cultivate your skills at negotiation, bluffing, and strategy while having a great time. Tomb Trader melds negotiation, deduction, bluffing, and set collection together with rare quality. It's a slick, intuitive experience that lacks some strategy but makes up for it in quick gameplay and varied ways to approach victory.